The robot overlords can sense your fear. Other people can often tell how you feel based on your facial expressions. Now, machines can do the same thing. A group of researchers working with the National Institute of Mental Health programmed a piece of software that can read users' faces and approximate their behavior. Furthermore, upon testing the software on images of celebrity faces, the researchers found that the software's appraisal of them was in line with public perception. "For some traits such as attractiveness and extroversion, there are relationships between specific structural features and social perceptions," reads a research paper published in the PLoS one science journal. Operating on this principle, a team of scientists from the United States and Spain designed a program to measure the dimensions of a human face, then conscripted a number of undergrads to rate the faces based on traits such as "Competent," "Trustworthy," "Mean," and "Frightening." 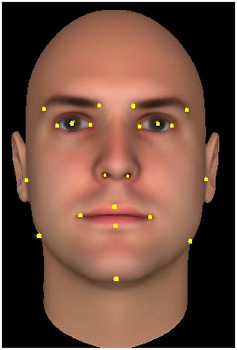 Combining the qualitative and quantitative analyses allowed the researchers to develop a system where a computer could autonomously predict an individual's traits. "In a world characterized by an ever growing amount of interactive artifacts, it is important to develop better human-centric systems that incorporate human communicative behaviors," the paper explains. Facial recognition technology already has applications in security and social networking, so taking the technology a step further could help everyone from sociologists to policemen. Of course, this breakthrough is somewhat limited by the fact that facial expressions are subject to interpretation, highly mutable, and vary from culture to culture. Still, a computer that can not only recognize a person, but also how the person feels, is one step closer to a truly autonomous machine. For your safety, we at The Escapist recommend wearing face-concealing Masks of Subservience when interfacing with machines from now on.